I hope you are all doing well and are having a great week so far. 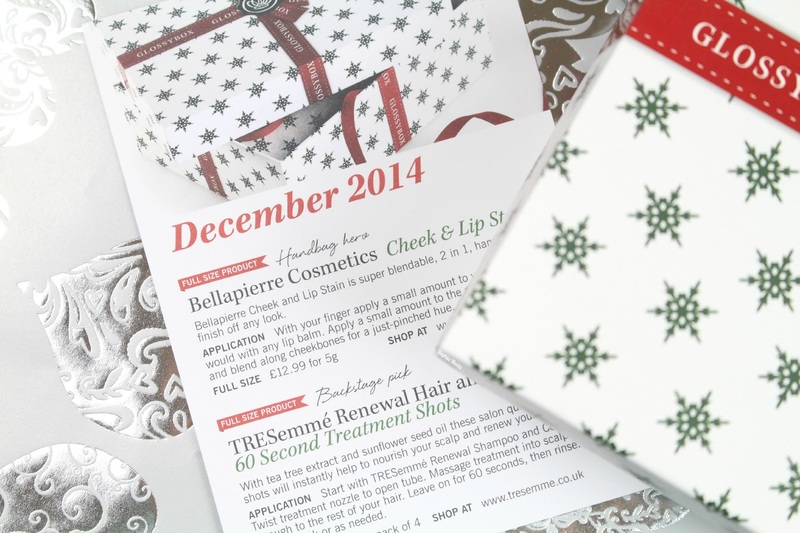 I was so excited when the brand new December 2014 Glossybox landed on my doorstep this morning that I couldn't resist sharing it with you for #blogmas day 8. Firstly, how festive is this months box?! I was so excited to see that Glossybox had given their classic box a little makeover - I just love the green, white and red colour scheme. Receiving the December Glossybox has made me even more excited for Christmas and the New Year. 2015 is looking pretty spectacular! As soon as I opened the box I was greeted by a gorgeous smell - it was these treatment shots by TRESemme. Treatment shots have always interested me, but funny enough I have never taken the plunge and given them a try. When I saw these at the top of the box I was so excited to finally give them a try. 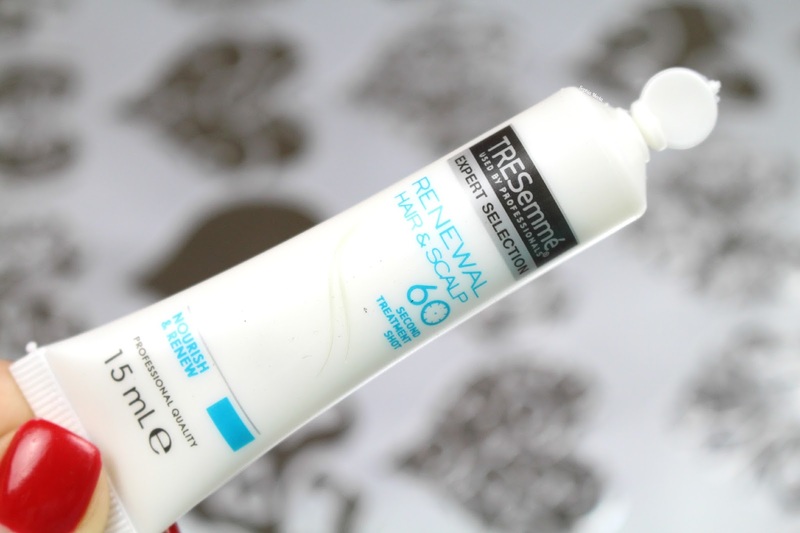 According to TRESemme these treatment shots instantly help to nourish your scalp and renew your hair, leaving it beautiful from start to finish. With tea tree extract and sunflower seed oil the salon quality formula helps nourish the scalp at the surface cellular level, leaving hair 3 times stronger. 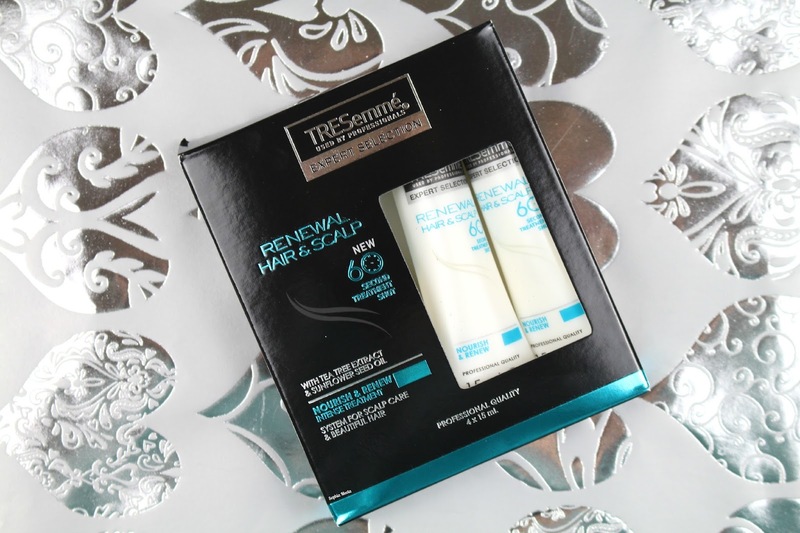 TRESemme recommend using these as a weekly treatment, so four a monthly supply £5.50 is a great price for this pack. This could not have arrived at a better time! I have been working so much recently and my skin has taken the toll - I have gained a huge blemish on my cheek (so lovely). 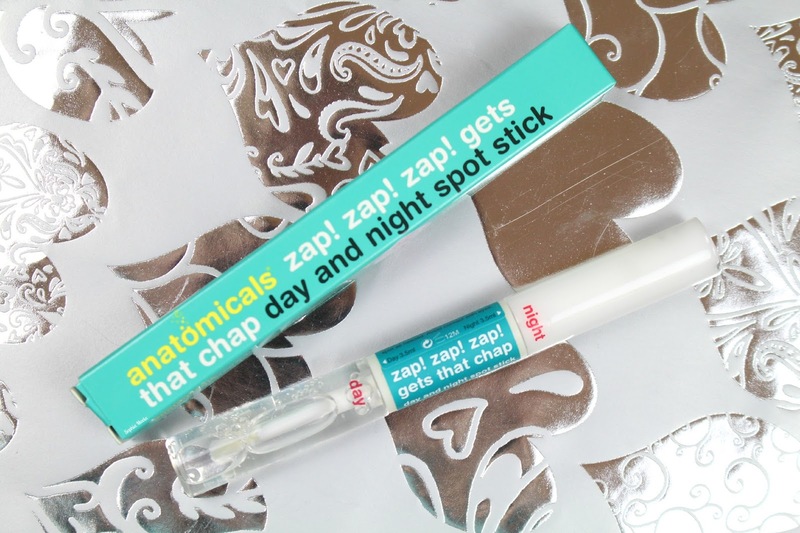 Anatomicals was a brand I was introduced to a few months ago through another subscription box so I was pleased to see something else from the brand to give a try. This is a double ended product that offers a day and nighttime formula to help banish those pesky breakouts. Simply apply a small amount on problem areas and let it works its magic throughout the day or night. I have to say this product has a lovely scent to it, I think it is due to the tea tree in the formulation which helps battle blemishes. SkinPep was a completely new brand to me but I always love trying out new skincare and discovering new brands. This was the only sample in the box this month but I have to say you are receiving a good sized amount of product. 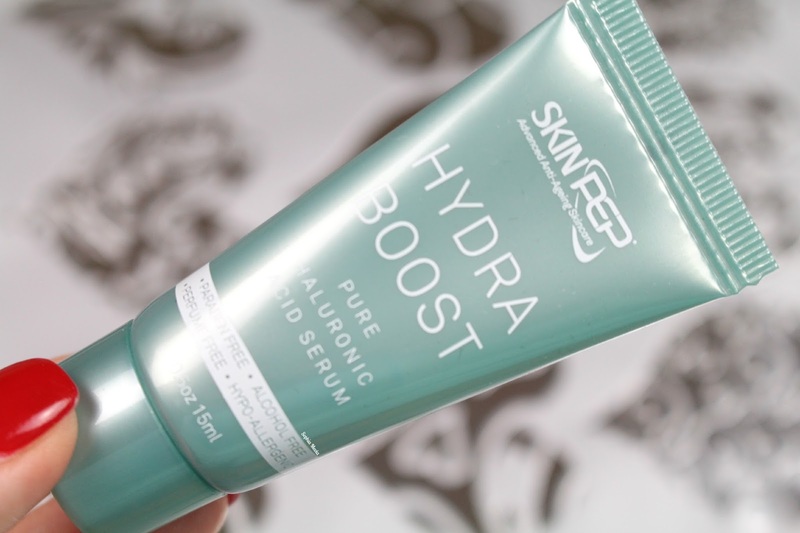 This Hydra Boost product contains the clinically proven cell communicating ingredient, Hyaluronic acid, in a perfume free, alcohol free, hypo allergenic formulation that is said to promote a healthy new skin glow. SkinPep recommend applying a small amount of the serum onto your face and décolletage area cleansing and massage into the skin for 1-2 minutes to promote and achieve skin hydration. According to SkinPep, Hyaluronic Acid is a natural shun cell component, found in the deepest levels of the dermis and it is able to hold 200 times its weight in water, which makes it an excellent moisturiser. Sounds pretty interesting right?! 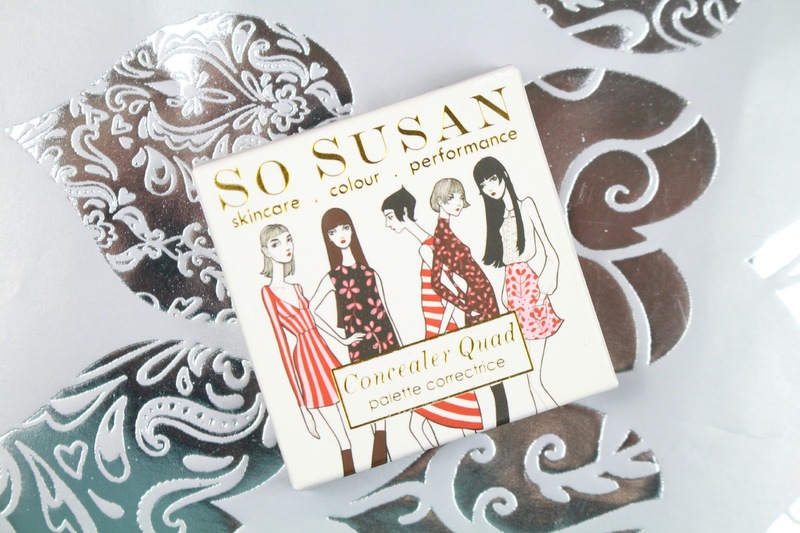 So Susan was another brand I was introduced to through another subscription box so I was please yet again to be able to try something else from the brand. When receiving products like this I always worry if they are the right shade for me and If I will actually be able to get use out of it. 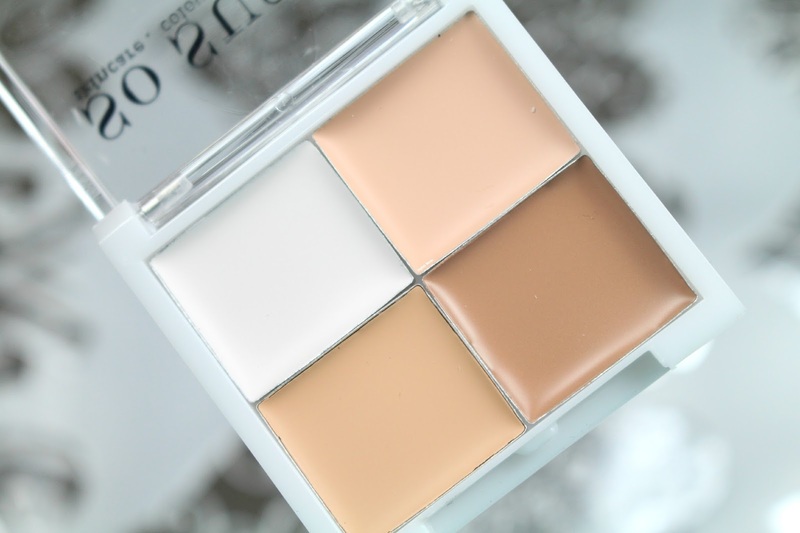 Well, the great thing about this concealer palette is that there are four different shades ranging from light to dark so there is something to work for everyone - you could also mix them together to create the perfect shade for yourself! This concealer palette is formulated with Virgin Marula Oil and has a super lightweight formula. The £20 price tag is a little high but if it works out for me then it would be something I would consider re-purchasing. I will keep you updated. 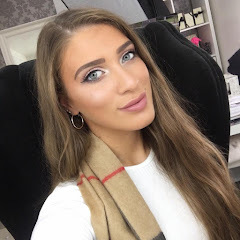 Bellapierre Cosmetics is a brand I have heard of a few times throughout the blogging community but one I have actually never given a try myself. I knew this product was on the way a due to a sneak peek in Novembers box mentioning this product. At first glance, this Bellapierre cheek and lip stain is a super blendable, 2-in-1 handbag hero in a gorgeous coral shade. I love products like this that I can throw in my handbag on the go and use throughout the day. 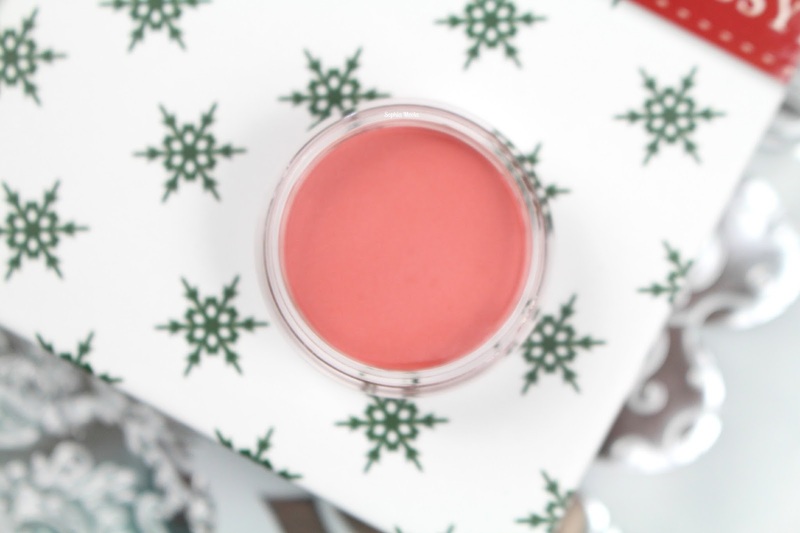 It is a super handy multitasking product that could be used on your cheeks and lips. Cream products like these are perfect throughout the winter months when skin is feeling a little dryer than usual...I am excited to give this a proper try as it is super pigmented and has a lovely light scent. I think this will become a handbag staple for me when I start my new job in January - the perfect touch me up product. 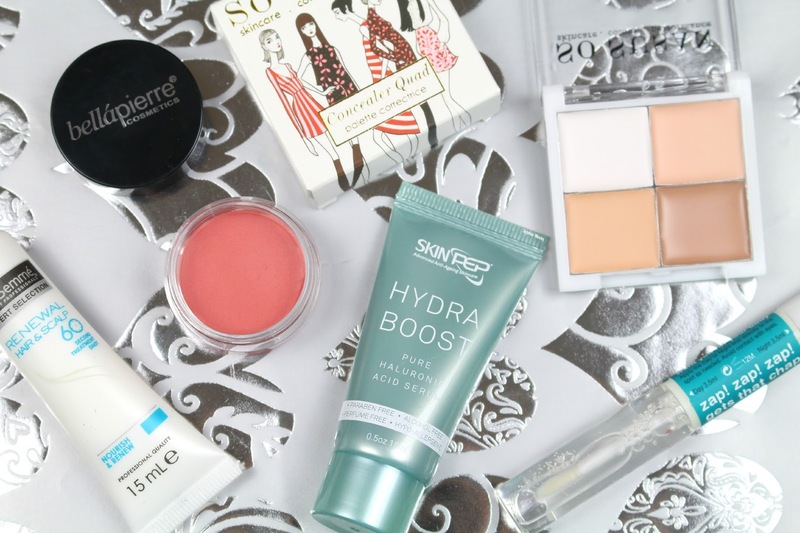 I hope you all enjoyed today's post and taking a peek inside this months Glossybox! I would love to know what you think? Overall, I am really pleased with Decembers box and to see 4/5 full sized products, however, being a festive box it would have been nice to see something Christmassy! I am looking forward to giving everything a proper try and bringing you some full reviews in the future - you never know, there might be my next holy grail product amongst these beauties. This months box works out around £51 which I think is great as the box itself costs £12.95 with postage. The box itself purely consisted of beauty and hair products, in comparison to the past two which have been a mixture of beauty, hair and lifestyle. I don't mind this at all as the product are lovely, I just think it is down to it being the party season and everyone wanting to get dolled up and pampered. Keeping in with my Christmas Gift Guide themes I personally think that a subscription like Glossybox would make a lovely gift for any beauty addict. 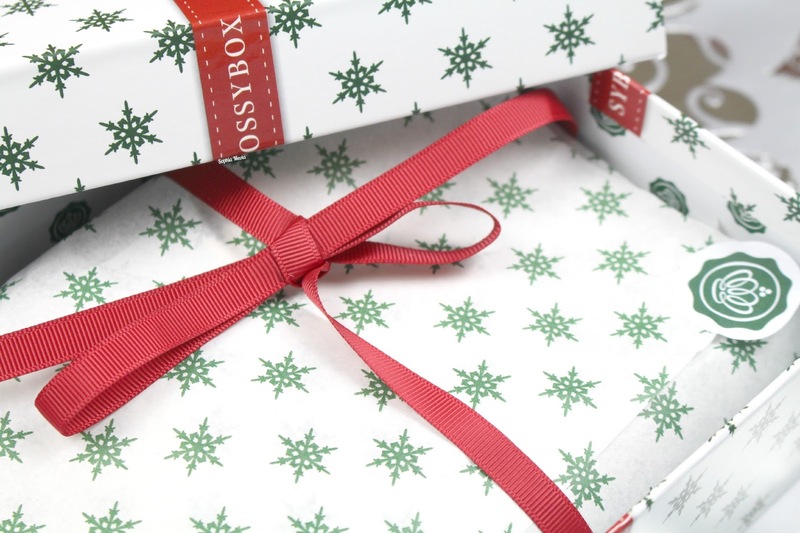 I would love to find a Glossybox under my tree at Christmas! Like always lovelies, if you have any questions, requests or if you just want a chat you can contact me on my social media or leave me a comment below. I love hearing from you all and I make sure to read every single comment…they really make my day! Looks like a good box! seen bad reviews for glossy box I think they have got better lately though. There are quite a few interesting products in this one!The hair shots and the skin Leo serum look really promising! I was searching on google for this month's glossybox reviews and I came across your blof and I love your writing and photography style :). It looks terrific, though admittedly, not particularly Christmassy. I like the look of the concealer quad and Bellapierre stain! Other than the packaging, which is festive, not sure how this is a festive box, am quite confused by it. Worth it for that gorgeous box alone!